A performance of storytelling - framed with music played by Vera Spillner. We call our performance Tales and Music because the musical part is particularly important for the non-native speakers in our audience. After each tale this provides a couple of minutes when the listener can reflect back on the story, with music which echoes and complements the tale's atmosphere. This allows the tale not only to be heard, but fully experienced. And when the story is a quieter, more thoughtful or poetic one, the music plays into parts of it, creating a wonderfully evocative combination of voice and music. 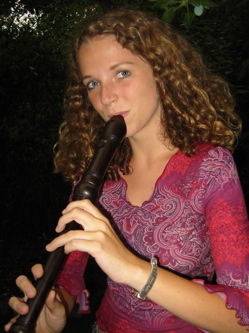 Vera plays various recorders and the violin, the music ranging from Irish folk melodies to klezmer. If you would like a performance of Tales and Music, get in touch: we offer a performance tailor-made to suit all requirements.